Since the U.S. Accord is larger than its global counterpart, Honda sells a version of the European/Japanese Accord as the Acura TSX. 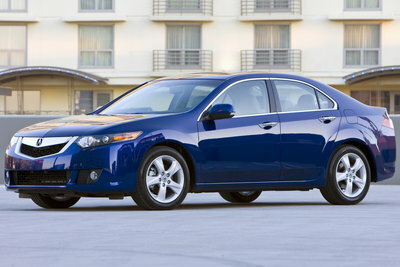 The smaller, front-wheel-drive TSX serves as the entry-level model to the Acura brand. Priced at around $30,000, the TSX offers a comprehensive set of standard features including HID lighting, a moonroof, and standard powered and heated leather seats. An available tech package adds a 10-speaker audio system with surround sound and Acura's satellite-linked navigation system. Although many competitive vehicles offer 6-cylinder power, the TSX sticks with a 2.4l four-cylinder engine rated at 170-bhp. However, the four-cylinder TSX turns in a respectable 21/30 EPA fuel economy rating. While the TSX may not directly compete with other smaller RWD performance models, it does stand as a practical and well-equipped alternative. The redesigned second-generation TSX is significantly larger. The new car is 3 inches wider, 2.4 inches longer and has a 1.3-inch wider wheelbase. Hip room and shoulder room increase but headroom decreases slightly. The standard engine is a 2.4l four-cylinder rated at 201-bhp. Torque increases only slightly to 172 lb-ft, but the torque band is wider. Exterior styling highlights include a new body with more chiseled edges, pronounced wheel-well arches and Acura's prominent metallic grille.